Spooky landscapes hang side by side with playful paintings of cats. Both are the work of Gertrude Abercrombie, a one-of-a-kind Chicago artist. Though she has been gone for 40 years, she is now getting a rare show at the Elmhurst Art Museum. “Chicago Tonight” visited for a closer look at this fiercely independent painter and her surreal life. Phil Ponce: A mysterious woman walks alone at night in an otherworldly landscape. A cat in a strange room seems likely to encounter a monstrous mouse. Susan Weininger, professor emerita at Roosevelt University: Her work is mostly autobiographical. It’s not exactly realistic, all the elements are realistic but they’re put together in a way that makes them something way beyond realism, and that’s why people often associated her with surrealism, although she certainly isn’t a kind of theoretical surrealist. Her work is often dark landscapes, sometimes with a small solitary figure in it, sometimes it’s an empty room, sometimes it’s a still life. But in all of those we see personal emblems, things that Abercrombie used over and over again. She was very fond of cats, she always had cats in her home. There’s often, in the outdoor scenes, a kind of characteristic spiky tree, the moon – she really associated herself with the moon. John McKinnon, executive director at the Elmhurst Art Museum: It’s a bit mysterious and a lot of fun as well. It’s always referring to these dreamy moments, something kind of surreal, and a lot of the different things became a shorthand or became a kind of visual language for her, a vocabulary that she used throughout many years. Ponce: Abercrombie grew up in Aledo, Illinois, the seat of Mercer County. She was the only child of traveling opera singers who settled in Chicago. In the 1930s, Abercrombie worked for the WPA and later showed her work at local art fairs. Weininger: She started her career actually as an artist at the Grant Park Open Art Fair that was held in conjunction with the big world’s fair, the Century of Progress Fair, so almost every artist in Chicago was out there. And she became someone people expected to see. She had an old Rolls Royce that was parked on the street, and she would set up all her paintings around that … and she got her own apartment, she could drink and smoke anytime she wanted and she did copiously and that began her adult life. In about the mid-‘30s, she made some friends who also were very involved with the jazz scene, and she became involved with jazz. She was good friends with Dizzy Gillespie, with Sonny Rollins, with Charlie Parker. 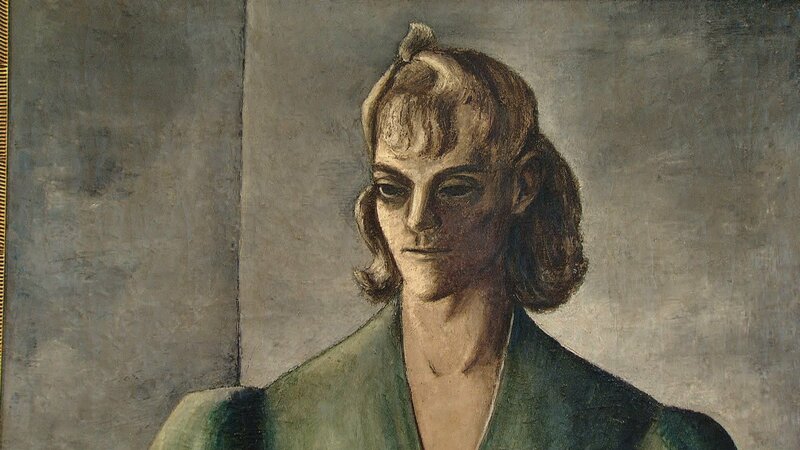 McKinnon: Gertrude Abercrombie presided over a wide and vibrant arts scene, including writers, musicians and artists. And you can tell that she totally inspired them in many ways. There are several works in the exhibition that were made by other artists of her, and so all these people on the scene embraced her as this “queen of the bohemian artists” or “queen of Chicago” as she self-proclaimed. Abercrombie also painted jewelry, tiny paintings and paintings within paintings. Weininger: Even though we see the repetition of these same elements over and over again, no two pictures are exactly alike. She always puts them together in some new interesting way. And there’s a lot of humor in her work, too. Ponce: The exhibition is the largest show of Abercrombie’s work in more than 25 years. Many of the paintings come from private collections, but about half comes from the Illinois State Museum in Springfield. McKinnon: The Illinois State Museum was a partner and this exhibition will tour there right after it closes here. This is the first show in a long time that is of such depth, encompassing the full career, encompassing a wide variety of materials, of media. Weininger: She spent a lot of time in the last years of her life getting her work back. She reacquired some of the work that had been sold so that she could create a legacy, which she did. Ponce: A few months before her death in July 1977, Studs Terkel interviewed Abercrombie at her home in Hyde Park. Weininger: This is an opportunity for people to see 43 paintings together. They span her career, basically. There’s a magical quality to them to too, and I think that’s part of the appeal. The exhibition “Gertrude Abercrombie: Portrait of the Artist as a Landscape” is on view at the Elmhurst Art Museum through March 4. For more information, visit the museum’s website. Jan. 30: The Field Museum’s famous dinosaur will be moved to the second floor as part of a planned makeover, and to make room for the eventual installation of a touchable cast of the largest dinosaur ever discovered. Jan. 24: Portraits of mummies greet visitors at a new exhibition where art, science and history intersect.